Did you know 80% of students receive funding to attend the largest university in the South Carolina? Or that some students can receive full tuition to attend a great liberal arts school in the state? There are so many great college funding resources available to South Carolina residents and we are here to guide you through all of them. Let’s look at the four steps you should take to help finance your education. The first step when looking for financial aid is clear: complete the FAFSA. The FAFSA (also known as the Free Application for Federal Student Aid) is a form that allows the federal government to determine how much financial aid you should receive. The FAFSA is based on need and not merit, so if you didn’t get that A on every exam, you don’t need to worry. The FAFSA also automatically considers you for some (but not all) state scholarships and grants that you might be eligible for, in addition to federal subsidized and unsubsidized loans. Unfortunately, the FAFSA is notorious for its length and its complexity. However, there’s no need to be discouraged because we have created a comprehensive, free, step-by-step guide to completing the FAFSA questions. With this guide you will be able to complete the FAFSA in time for dinner (maybe). While Federal funding can be extremely generous in some cases, you should also look into all of the resources that the state has to offer. For state financial aid, look no further than the South Carolina Commission on Higher Education, which has a comprehensive list of available resources. There are many scholarships and grants that you might be eligible for. You can also look at this brochure that gives a brief outline of the scholarships and grants available. Here are some South Carolina scholarships that might be applicable to you. Palmetto Fellows Scholarship is a merit-based program to encourage excellent high school students to attend college in-state. LIFE Scholarship is a financial opportunity for students who are academically distinguished in high school to receive funding to attend an eligible SC school. South Carolina HOPE Scholarship gives eligible high school students with a GPA of 3.0 or higher the opportunity to receive a maximum of $2,800 per year to attend a SC institution of higher education. In addition to scholarships, there are also many grants that are offered to South Carolina residents. South Carolina Need-Based Grant Program gives students from the most challenging financial backgrounds the opportunity to receive funding to attend a SC public institution. Lottery Tuition Assistance provides funding to qualified students who are attending a two-year institution. South Carolina National Guard College Assistance Program provides funding for students interested in joining the South Carolina National Guard. Remember, scholarships and grants do not need to be repaid. Make sure you apply to as many as you can in order to lower out-of-pocket tuition costs! In addition to federal and state funding, institutional and local scholarships can be useful for students looking for additional financial aid opportunities. Let’s look at the University of South Carolina, Columbia, which hosts the state’s largest undergraduate population. Get this: over 80% of students at this university receive some sort of financial aid at the University of South Carolina. The school even offers a cost calculator to help predict what your tuition will look like. There are also different types of financial aid offered by the school. Some of these are general university scholarships, departmental scholarships, SC residents scholarships, as well as other scholarships. The University of South Carolina is not the only school with many financial aid resources. The College of Charleston (a highly regarded liberal arts school) has an incredible amount of scholarships and grants available to students. For example, all Palmetto Fellows receive at least $4,000 in funding, known as the Palmetto Promise. Further, the College of Charleston gives out a prestigious award called the Colonial Scholarship, which provides funding for four years of tuition for distinguished students. Despite the great financial aid resources that are available, many students still find themselves needing additional funding to cover tuition costs. If you are in this position, you can still attend college by taking out a private student loan. Of course, it’s smart to find the best rates available so you aren’t paying more than you need to. 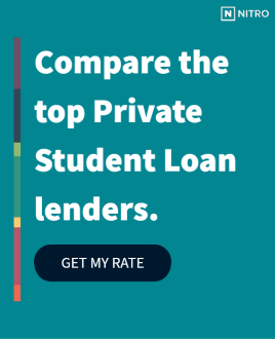 That’s why we’ve highlighted the best banks for private student loans to help you select a competitive loan package from a reputable lender. College is a huge investment, so you’ll want to take a “big picture” look at how a student loan my affect your finances. That’s why we’ve built the NitroScore tool, which can help forecast your post-college financial situation by taking into account your school, major, financial aid, and loans. Now that you have all the information you need to start financing your education, rest assured that you are one step closer to a bright future in whatever you choose!